Tableau and Salesforce are designed to work together: Tableau visualizations can be embedded within the Salesforce application. This capability makes Tableau a great choice as a third-party analytics tool for analyzing Salesforce data and more. Tableau lets you visualize data rather than scroll through rows of numbers and can take you beyond the reporting capabilities native to Salesforce. Provides an at-a-glance overview of sales accounts and opportunities, eliminating the need to scroll through text. Provides access to Tableau visualizations from within a Salesforce dashboard, eliminating the need to go out of Salesforce to run reports. Refreshes visualizations automatically for any account. Allows users to click through Tableau visualizations from a dashboard, making it easy to track opportunities and different accounts. Lets you pull in data from other sources, in addition to Salesforce. Lets you combine data across Salesforce modules, e.g. displaying engagements and pipeline growth on the same chart. 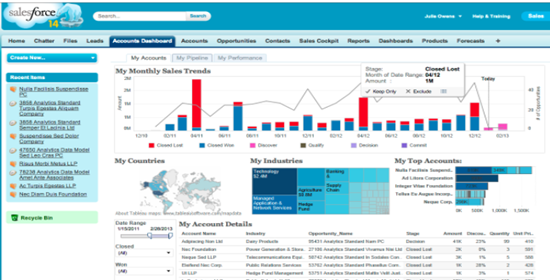 Read more about the benefits of using Tableau to do your Salesforce reporting. The adaptors that allow this integration are free, but installing and configuring them is a bit tricky. If you’re the hands-on type, you can get the installation and configuration instructions in our recorded webinar. However, if you require assistance – and many of our clients do – Senturus can make the integration happen for you, efficiently and cost-effectively.